Having been in Russia as a missionary from South Africa for seven years, I met my future wife at a missions conference in Yakutsk in 2002. Marianna was born in Yakutia. Both her parents were Sakha (Yakut) with no knowledge of God. At an age of twelve, however, being among some of the first Yakut converts, she repented and was baptized soon to be actively involved in the local church. God made our paths cross often through similar ministries and interests and seeking His will in prayer we soon discovered God had an exciting plan for our future! So in 2004 we got married and since then we have five lovely children. Daniel is the eldest, twelve years old, and very interested in technology and history. Melinda, being ten, is the eldest of four girls. Both she and Annamari, seven, love ballet and take piano lessons. Liza, she’s five, and Marika, who is still three years old, can spend hours playing with dolls or stuffed animals. We live in Kuranakh, a small Russian gold miners’ town in southern Yakutia, Far East of Russia. It’s 310 miles south of the capital Yakutsk, which is at the same latitude as Palmer! Winters are colder but less humid and the summers warmer with more sunshine. In Russia, in general, there is enough freedom to evangelize and have most church activities without restriction. However, we learn to be wise in circumventing the effects of new anti-missionary laws and soviet-era stigma still attached to concepts like “Baptists”, “Protestant Churches” etc. In Yakutia we have seen a tremendous growth of churches and of native believers in the last 25 years of missionary work. It’s very exciting to have the privilege of being part of that. Our journey to Alaska as a family has its beginnings in prayers and hopes born two years ago when I came to Alaska on my own to look into flight training for missions. Realizing that there is much more to be done to finish my flight training we were praying for the opportunity to be able to come long term and thus as a family. In 2015 I had the opportunity to visit Palmer for the inauguration of President David Ley. I was slowly starting to revive a long time dream to have some sort of formal theological study. Soon we were looking into enrollment as an international student and being able to finish flight training. A lot of paperwork was involved in making that happen but God was blessing us all the way. I remember God’s mercy so vividly when we had to travel to the closest Consulate of the USA for our visa interview. Marianna and I got in the plane for a three to four hour flight with vague ideas of what to do in an unfamiliar city when suddenly one of the passengers getting on the plane coming down the aisle stopped to talk to us. “My name is Ivan and you can stay with me at the Korean Seminary in Vladivostok. I have a taxi come and get me and I’ll take you there with me.” God arranged our accommodation and more. Ivan even took us to the Consulate! The interview went well and our visas were approved. Many others’ visas were not. God showed such favor! He provided the funds for the plane tickets. And we were able to obtain tickets on an almost direct flight flying from Yakutsk through Kamchatka to Anchorage. What do I enjoy most? To spend so much time in the Word and in stimulating discussions of application to ministry. This is something I have been yearning for, for several years. Sometimes in class it seems like I have to hold back half of my questions to not disrupt the teaching process! We have been so blessed by the community of believers here in Alaska since we came. From the very first day we felt so welcomed and at home. Brothers and sisters in the faith have been very caring and attentive to possible needs helping us with things like transport, finding housing and getting ready for the colder months. I have anticipated our time of adapting to be hard at times. Yet, since we came my family hardly had had a day or two without a chance to speak Russian to someone. We have also been having wonderful fellowship with the Russian Church in Wasilla. While we were in Yakutia we came to a point where we were in need of a break in our ministry. And even though our proposed year in Alaska can hardly be called a retreat, I can already witness that to me it is becoming a much needed “Sabbatical” of some sorts. 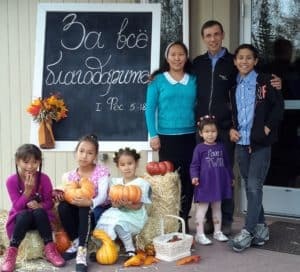 Ever since a short term outreach to Russian Christian summer camps in 1994, the Lord has laid it upon my heart to minister to the least reached peoples of the Russian Far East. In the fall of 1995 together with a friend of mine, we came to southern Yakutia to live in a small village to learn the language and slowly begin to participate in ministry towards the Evenki. They are an animistic minority people group living across an area the size of the USA. The challenge of reaching them stems from the fact that they are so scattered in small pockets and live mostly in the woods and remote villages. They herd reindeer, fish and hunt. We have been doing trips to some of these villages, at times spending time in the forest to visit with the reindeer farmers. Among them we have been doing church planting and children vacation Bible schools. In the Russian town where we stay, both Marianna and I are involved in church activities including preaching, leading prayer meetings, weekly Bible school for the children and music ministry. Once a year we also join a team to serve young people at our Republic wide youth camp where about 60-70 young people gather for a week coming from a dozen or so widely spread, and times rather remote, Yakutian churches. The main challenge is to trust God to make the impossible come true. In Russia while preparing we could see God at work. He found people to stand in for ministry, to look after our flat and even take care our dog! Coming to Alaska, one of the first challenges was to find housing for a family of seven for the winter. This had been a constant prayer and a faith stretching experience. On the very day we met the staff of ABC, one of the staff members mentioned that they had just heard of a house that was available. God was once again answering a prayer and a need! Another challenge for my family was and still is getting use to the English language. Especially for the children. Yet I’m encouraged to see their eagerness to learn and to take on the unknown fearlessly! The children’ section of ABC’s library has become a big blessing for them. Especially when Marianna and I attend class together! And then there is the economical difference between Russia and the States. Being very aware of the fact that the exchange rate is not exactly favoring our rubles, we have been trusting in faith that what the Lord has started He will surely see through to the end. And this the Lord has been confirming time and again. Even though I really have nothing to compare my experience with, I can deeply appreciate the uniqueness of theological studies at Alaskan Bible College. I think some of it is the setting, the latitude and the nature. Some of it is the family atmosphere of staff and the student body where everyone knows each other by name. And some of it is the priorities of submission to God’s inerrant Word, the devotion to the unity of the body of Jesus Christ and the passion for the Gospel of Salvation to the lost. And some of it is simply the Spirit of God bringing souls together to transform them into His likeness, into useful instruments for His Kingdom. Whenever I see an empty chair, I think: “Someone is missing out!” Thank you, Jesus, for making it possible for me. May You fill that chair soon.